We found more than 175 free printable Superhero coloring pages and superhero fans are going to love the selection. 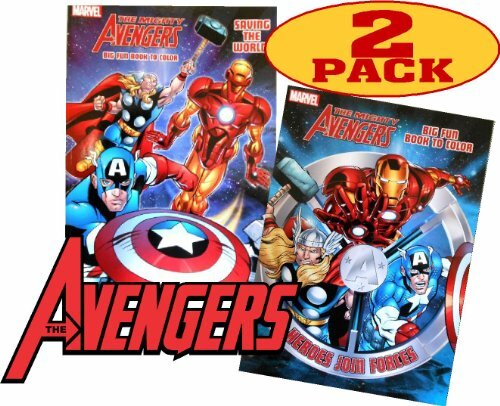 If you have someone in your household who is all about superheroes then this post is for you. Coloring is relaxing and can provide some down time for both moms and kids. 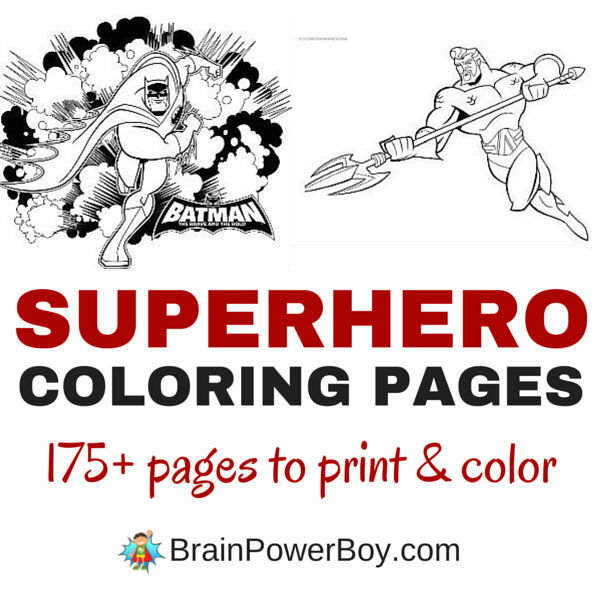 We gathered together the very best superhero coloring sheets for you to print completely free! Print them now so you will have them on hand for when you need them. Every once and a while I will take a look to see if there are new pages available and will be updating this page when they release more free printables to add to our activities for boys articles. It took me a long time to sort through all the sites and find these, but it is so nice to have them all in one place. They are all from official Marvel and DC Comic sites, so you will not have any problems with downloading the pdfs. I hope you will use this as a resource and refer back to it when you need some coloring pages. You can pin it or bookmark it for later. Is your boy an Antman fan? Try these 4 Antman coloring pages. 10 Aquaman free superhero coloring pages printables. These are pretty neat. 6 here and 4 more coloring sheets here. The Avengers coloring sheets continue to be popular. Here are 3 different versions. Another Avengers choice with 2 pages. Plus 14 more including The Hulk, Captain America, Thor, Hawkeye, Iron Man and others. Batman and The Blue Beetle. There are 4 printable Batman coloring pages available. 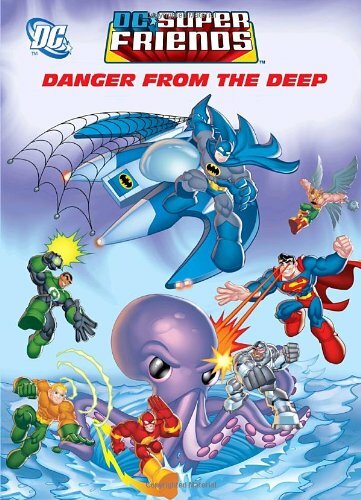 Batman The Brave and the Bold pages with mainly Batman on them but there are small pictures of Blue Beetle and Red Tornado whom you hardly ever see. 5 total. If you are coloring Batman pictures, you can’t forget the Batmobile! 4 views included. 5 Big Hero 6 coloring pages and 2 draw the scene coloring pages. 5 slick The Flash pages to print including his logo. Green Lantern has 6 printables with his logo. The character pages are in two very different styles. Hawkman with others, 4 coloring sheets in all featuring Hawkman and Hawkwoman, Batman, and The Flash. 5 The Justice League character coloring pages, Martian Manhunter (who I never heard of until now,) Hawkgirl, Wonder Woman, Superman, Green Lantern, Batman and The Flash. More Justice League! Here is a different style that might be nice for older boys. Each free superhero printable has 3 – 4 views of the superhero. 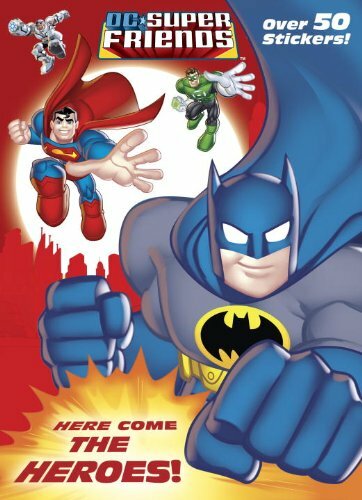 Includes coloring pages for The Flash, Batman, Wonder Woman, Green Lantern, and Superman. These might work best with colored pencils or markers. Find more Superhero coloring sheets below! 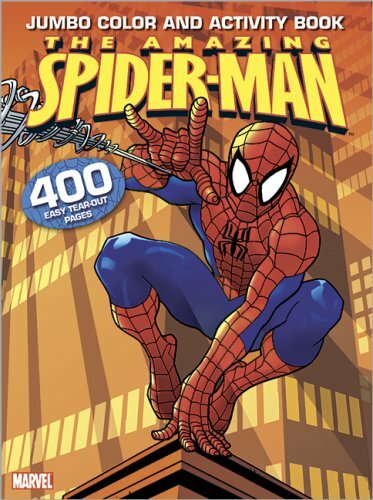 Anna from In the Playroom has 3 coloring page Spider-man selections and activity pages. 5 DC Super Friends pages with a variety of superhero characters. 6 Superman free printables including his logo and “superman” wording. 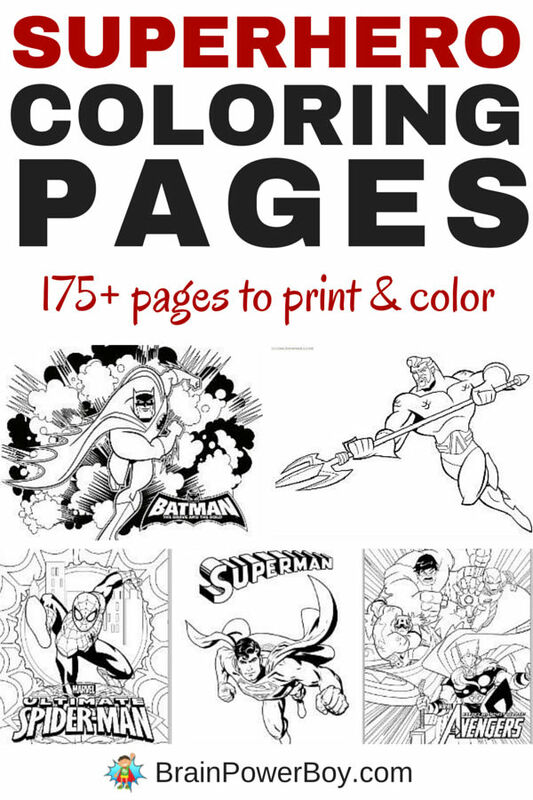 6 different Superman coloring pages. Plus 6 more pages. The logo and superman wording is duplicated in these but the coloring pictures are different. 5 Teen Titans coloring pages featuring Cyborg, Beast Boy, Robin, Raven and Starfire. 6 Teen Titans Go coloring pages including their logo. If you are looking for the villains try these 5 DC Villains. If you have a LEGO fan be sure to check out our article on 180+ LEGO Coloring Pages. 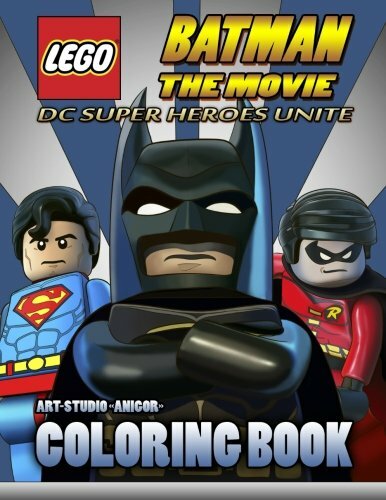 There are some LEGO Superhero coloring pages included in the article. I hope you like these Free Printable Superhero Coloring Pages as much as we do. Print some out and keep them for a day when you need something relaxing to do. They are also great to print and take to a restaurant, to an appointment, or along on a trip. Don’t miss Star Wars Activity and Coloring Books and pop over and see my friend Clare’s Kid’s Coloring Pages as well. 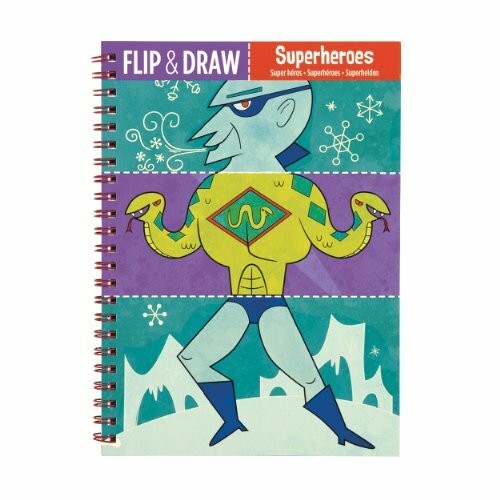 Plus check out these cool Superhero Crafts! Wow, what a comprehensive list of superheros. I’m going to check some for them out for my 5 year old grandson. I know he’ll enjoy them. Thanks! I’m sure you will find some he likes. This is just amazing! My three year old loves Avengers, Batman, Big Hero 6, Lego anything, and spider man. Thank you for sharing this! Hi Lauren – thanks for stopping by 🙂 I hope you find some good ones he will like. Oh my, I will definitely have to check this our for my 8 year old neice. She and her dad love superheros! Thanks for sharing! Great Celina, I hope she enjoys them! Awesome! These will come in handy when my little ones are older. My boys are going to LOVE you! This list is awesome! Thanks for sharing at the #Made4Kids Link Party! Yay – I’m so glad they will enjoy the list Karen. I hope they find a lot of coloring pages.